Find great offers with our 2012 Subaru Outback Specials & Sales available at Subaru Superstore, your trusted Arizona Subaru dealership! The 2012 Subaru Outback is stocked full with the versatility to take you on any adventure. Explore all that Arizona has to offer,on and off the road, as the Subaru Outback has all the essentials you need to blaze a path and explore wherever you need to go. Come visit us today for a test drive to discover the quality and performance in the new 2012 Subaru Outback. Find out more on the Specifications & Details on the new 2012 Subaru Outback at Subaru Superstore in Arizona. 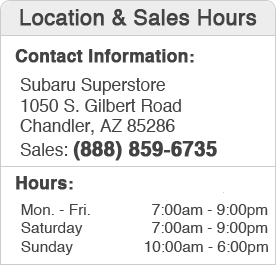 Subaru Superstore, your trusted Arizona Subaru Dealership is honored to offer these great Discounts, Specials, and Deals to anyone looking for a competitive price on a New Subaru Vehicle Offer. Here at Subaru Superstore, we specialize in providing you with the highest quality Subaru vehicles, hand selected by us. Our customers enjoy their purchasing experience with us because we believe in a straight forward, simple and quick, car buying experience. At Subaru Superstore, we don't play games and add extra dealer packages to our new vehicles to confuse you or to add unnecessary costs to your vehicle. We encourage everyone searching for a new car in Mesa, Scottsdale, Chandler, Gilbert & Tempe to take into consideration the quality and performance Subaru has to offer! Call or fill out the form above for more information on upcoming or current sales specials!